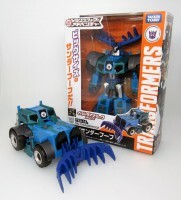 Takara-Tomy’s Hisashi Yuki has tweeted a couple of images of the Transformers Easy Dynamic Big Thunderhoof. 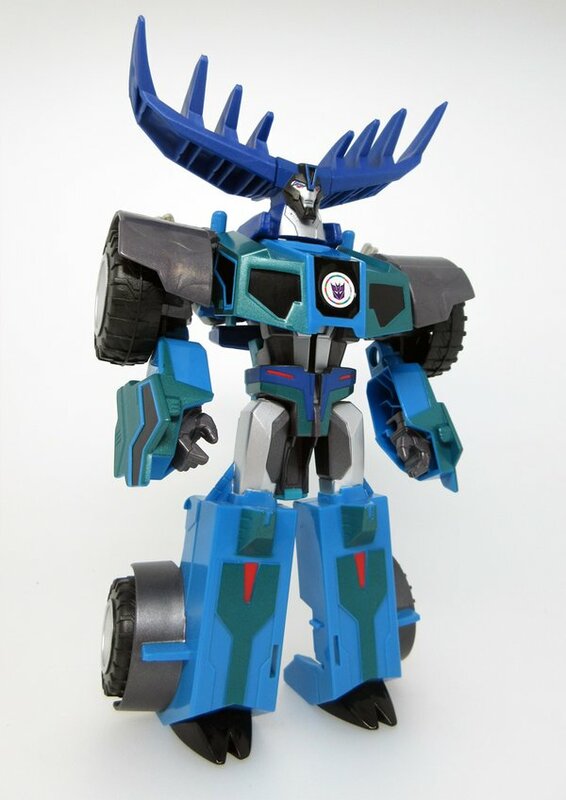 Big Thunderhoof is the Japanese market release of the Robots in Disguise Three-Step Changer Thunderhoof, who was recently released at US retail. These images give an idea of the tweaks that Takara-Tomy has made to the deco of this toy for Japan. Check out the images attached to this post. Both in that image are the one steps. New images compare with the warrior version. Or is it the one step? really missing voyager class figures right now voyager decepticons would have been awesome for this line. Looks rather disappointing…i wish they added more articulation to him like they did with that one Optimus. Takara didnt retool any RID figures, did they? I think the optimus you are referring to is a whole new mold. I dont expect them to do a new toy for every figure. Let me know if I am wrong about the optimus you were referring to. Since when did Takara become turd polishers? I thought their transformers market was much smaller than in the USA, more adult if you will. So why are they throwing 25 coats of paint on a mold aimed at children? You think thats bad, Hasbro decided to spend extra budget retooling the 3 step Optius and Bumblebee modes for the TRU exclusives. They didnt do that with the Optimus and Bee Warrior figures, but they do it for the 3 steps ?! It always seems like some kinda sibling rivalry with Takara, always gotta one up the younger brother. I'm honestly kind of surprised they didn't attempt to cash in on the time of year and make a holiday themed Transformer. I would totally buy this repaint. Behold… Rudolphimus! Y'know… if they released this design with some proper joints, I'd actually buy it. I know Hasbro is targetting the kiddie market and the adult market separately these days, but I'm really getting sick of all these figures coming out in formats that totally obstruct most of the articulation. What is the hyper change? I see it's not the deluxe or legends right? This is the Japanese versions of those 3 steps, like Underlord said, but the Japanese ones have all the paint apps and have better quality control. It's one of those big three step ones, I think Hasbro has released grimlock, sideswipe, optimus and Steeljaw, but I don't think they have released thunderhoof yet. Well that explains it, I've only just noticed Steeljaw on the shelves here , Thunderhoof will proberly be out after chrimbo. Next year bro. Next year. I will actually probably buy this haha. Me too! I love these figures. That's 2 things now that we agree on that others were weary of. I've bought every one so far with the exception of giving Grimlock to my.son after a month or so owning him and.I returned Steel jaw. I liked the toy but the deco was all wrong. The JPN version is done with better more accurate colors, and MUCH more details. Matter fact they ALL have awesome paint ap & deco choice. That's why I love Takara when they save money on parts count, they give back to the collectors & fans by putting ULTRA detail and sparing no paint ap. I like how YouTube Reviewer Emgo makes this guy stupid, oblivious, and obnoxious, (with his fake NorthEast accent) in his skits, by making him incessantly proclaim, "Hey, I'm TUNDERHOOF!". He just came out this month in the US, actually. Really recent release – probably not hit stores in all areas yet.